MAGIX Fastcut 1 is included free in new copies of Web Designer Premium and Designer Pro X during our current special offer, ends 28th February 2017 (excludes upgrades, Xara online store only). Previously sold by MAGIX for \$69.99 / €69.99 / £59.99! Fastcut lets you create videos that are just as exciting as your adventures. Various action templates make editing recordings from GoPro and other action cams easier than ever before. Plus they can automatically cut your footage to fit the beat of the music. Fall down. Get up. Share video. Set the perfect stage for your adventures. Wherever your adventure begins, what matters in the end is what you make of it. Your biggest wave, your quickest run, your highest jump: Share your experiences with the world. 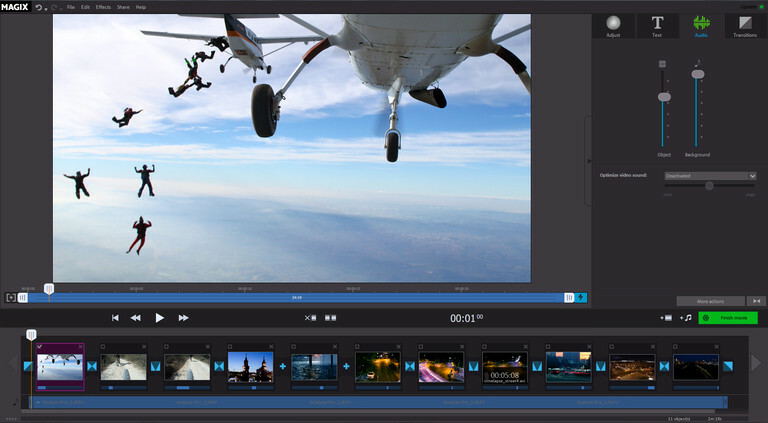 MAGIX Fastcut makes editing and sharing your action cam recordings easier than ever before. This links to the Magix site where you may occasionally find different offers or bundles, please note that if you order from Xara we only supply the Magix product listed on this page at the price shown. VAT will be added to the prices shown on this page if you enter an address in the European Union (EU) at the rate current in that country. even on low-performance computers. The technical data for your computer can be found in the control panel of your operating system. - Internet connection: Required for activating and validating the program, as well as for some program functions. Software can also be used offline. However, please note that the program requires an Internet connection at least once a month to validate the license. Some advanced program functions demand more of your computer's processing power. To get the most from these functions, your system should at least meet the following recommended requirements. The technical data for your computer can be found in the control panel of your operating system.